Puerto Rico's $70 billion of debt looms like a dark cloud over the island. The U.S. Congress just introduced two very different bills that could potentially help Puerto Rico. One option offers Puerto Rico cash, tax cuts and oversight but no legal power. The other offers no cash, but gives it legal power to restructure some its debt. Puerto Rico has already defaulted on a small portion of its debt in August. But it faces much larger payments soon. Puerto Rico's governor, Alejandro Garcia Padilla, said earlier this year the island's economy is in a "death spiral," unable to pay its debts. He and other leaders have stepped up their calls to Congress to help Puerto Rico. "We're out of cash," Padilla told CNN's Richard Quest on Thursday. "Puerto Rico needs a tool to restructure the debt." 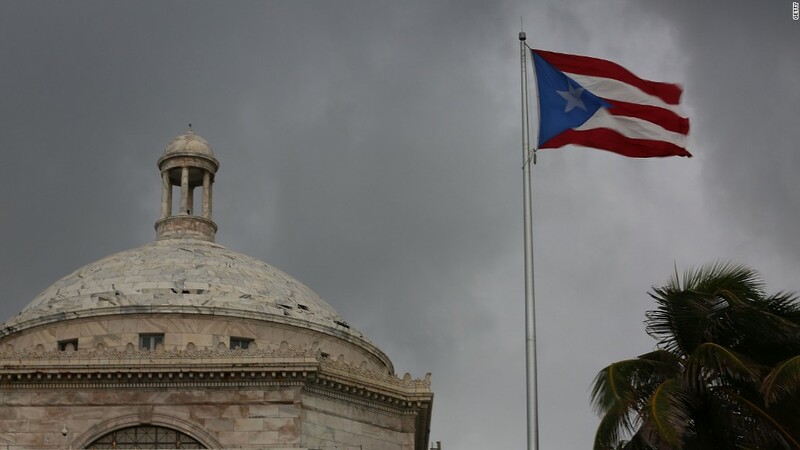 The Senate Finance committee, led by Republicans, proposed a new bill Wednesday that would offer $3 billion in emergency cash to the island's government and would also slash a key federal tax for Puerto Ricans. Additionally, it would provide federal oversight to ensure Puerto Rico has sustainable debt plans going forward. The bill would cut the federal employee payroll tax -- which funds Medicare and Social Security -- from 6.2% to 3.1%. The thinking is that it will give a small pay raise to ordinary Puerto Ricans which could help stimulate the island's struggling economy. The bill aims to "lay out a sustainable framework to improve Puerto Rico's finances and its economy," says Republican Senator Orrin Hatch, who is leading the bill. But Puerto Rican leaders really want the legal power to restructure the billions of debt in court, which is known as Chapter 9 bankruptcy. It's a legal authority that all 50 U.S. states have. But as a U.S. territory, Puerto Rico does not. That means Puerto Rico must negotiate individually with each group of its bondholders -- something that could take years, experts say. Rep. Sean Duffy, also a Republican, wants to give Puerto Rico access to bankruptcy. He proposed a separate bill Wednesday that offers no aid to Puerto Rico, but gives it access to Chapter 9 bankruptcy. There's a big catch to Duffy's bill though. Much of Puerto Rico's debt doesn't qualify for Chapter 9 bankruptcy because it belongs to the island's central government. Debt must be owed by institutions or local towns in order to qualify for Chapter 9 bankruptcy, according to Cate Long founder of Puerto Rico Clearinghouse, a research firm focused on the island's debt. So even if Puerto Rico got Chapter 9 rights, it wouldn't be able to renegotiate much of its $70 billion in debt. Puerto Rico has requested "super Chapter 9" which would allow it to renegotiate all its debt. But Congress -- and thousands of bondholders -- oppose that solution. The Senate's proposal, which offers billions in cash, is the island's best bet, says Long. "This is extremely positive for Puerto Rico," says Long. She says it sends the message that the U.S. government will offer help and oversight, "but you have to fix this problem." However, Hatch's bill could come under fire from Democrats -- the $3 billion in immediate cash for Puerto Rico would be taken from funds for Obamacare. That money would be huge for Puerto Rico. It owes nearly $1 billion in debt payments on January 1, and Padilla told CNN Thursday that the payment will be nearly "very difficult" to make. Some experts agree. "We continue to view default as likely on future commonwealth debt payments," says Ted Hampton, an analyst at Moody's who covers Puerto Rico. That $3 billion could be used to service future debt payments, says Long. It's highly unlikely the bill would pass before Puerto Rico's January 1 payment. But its next big payment after that is in May -- plenty of time for the cash from Congress to help Puerto Rico cover its debt obligations then.